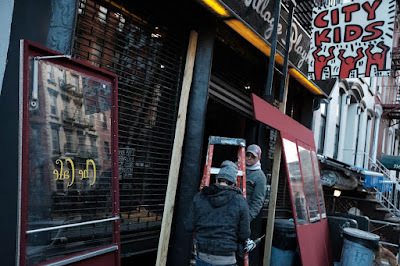 Back on Jan. 10, Derek Berg spotted workers installing the Cafe Che winterized doorway on the front of the new East Village Playhouse on Sixth Street. Not a good sign, at least for Cafe Che, which then went dark. I asked owner Mark Merker, who launched Harry's and Benny's Burritos in 1987, what was happening with Cafe Che. He started selling empanada pocket and other items last April at 86 E. Seventh St. just west of First Avenue. "Right now we are in a pause," he said, and that he hoped to return in a few weeks with an expanded menu. And yesterday, Cafe Che was back. As Jeremiah Moss first reported, the space is now going as Benny's Burritos & Empanadas. The expanded menu will eventually include burritos and empanadas, along with tacos, chicken tortilla soup and more. Merker told me last night that the burritos will be on the menu in a few weeks. Oh, and what about the Cafe Che winterized doorway? "That needed to come down because of a complaint called in to 311," Merker told me. i loved benny's burritos and was sad to see it close. In the past 3 years, I have tried every burrito in EV with no luck of reordering from a restaurant a second time. People complained Benny's was bland, but i would prefer to spice up my own burrito than bite into one i can't eat and end up throwing away due to too much salt, stringy chicken etc. That location oozes good vibes. It used to be Abraço, the coffee place, before they moved across the street to a much larger space. The best of luck to the new entrepreneurs. As a sucker for burritos and tacos,I will certainly give them a try. I live on that block and can't wait to get a burrito there! Will you sell the HUGE vegetarian burrito with beans, rice, guacamole, sour cream, salsa, green sauce, and cheese you sold at the Harry's Burritos location at 93 1/2 E.7th Street a few doors down from and east of your new location on E.7th Street? Happy for Benny's return in any form! Please please please please please have a vegetarian burrito. My favorite burrito place was San Loco, and miss the store closing on Avenue A.
Oh they'll have a veggie burrito, 3:26pm, it just better be like the one Harry's and/or Benny's sold or no dice. I don't wanna see sour cream zig zag outside the tortilla like pastry BS alot of Mexican restaurants have. complaint about the winter shelter????????? wtf EV residents. why are you complaining about that to 311 and making him take it down?